The stuff we don't like to think about.. when our friends cross over. This is the bittersweet time when our hearts break. Sometimes we are lucky enough to plan and prepare ourselves for the day our dogs cross over. Other times, their crossing comes suddenly. Either way, we hurt just the same and wish they could live with us forever. Only time will transform our many tears to happy and loving memories. Then we realize how blessed we are to share our lives with such wonderful creatures. We make our urns using clear pine (no knots). The lid is secured by four small round brass nuts. 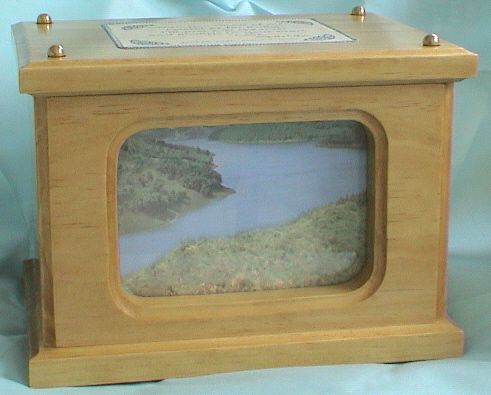 The boxes are big enough to place ashes and other treasured memories. We line the inside of the urn with heavenly blue felt, (just a reminder of where all dogs go when they cross over). Our gardens are graced by over 200 Lavender plants and we put a bit of lavender in each urn. 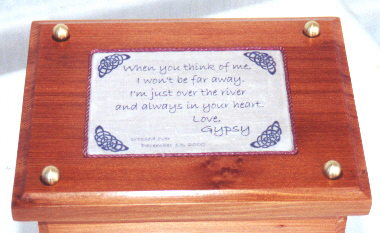 An inlaid cloth crossing message adorned with Celtic knots and personalized with your dog's name and dates rest on the lid. 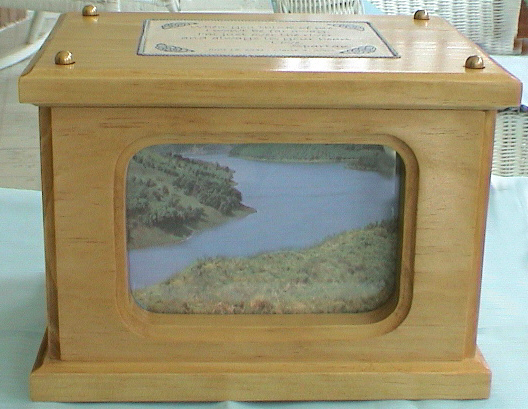 The front panel has an area for a photo of your dog, with glass not plastic. 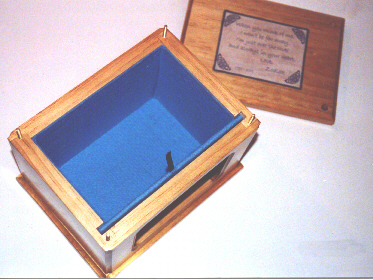 The photo size for the small picture dog urn is 4" x 4" . 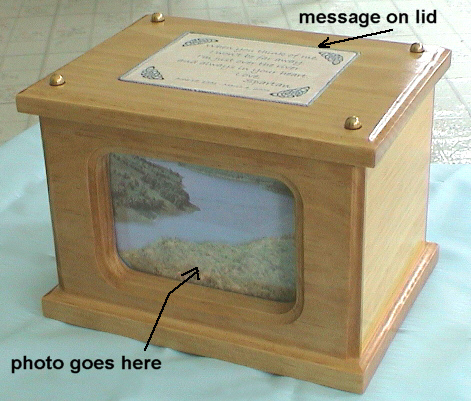 The photo size for the large picture dog urn is 4" x 6", (the large size fits a standard 4" x 6" photo). We include a print of the Welsh Crossing River in the photo panel so you have time to choose the favorite photo of your dog. You may include the birth and death dates at no extra charge. "When you think of me, I won't be far away. I'm just over the river, and always in your heart. Click here to see a close up of the lid. If you want another message on the lid rather than our crossing message or the above rainbow bridge message, we can do that for an additional fee please contact us. Crossing over the river: Some cultures refer to death as crossing over the river. We embrace this idea and, so the picture we use (it's in Wales) and the crossing message reflect this sentiment and include this with our dog urns. There are many resources on the web about pet loss. Rainbow Bridge is quite popular. We will add a few links on this page to pet loss sites in the near future; also a page sharing our experiences and thoughts about living with old dogs and when we must to let them go. Please visit our sweet memories page, and share some memories of your dog. WARNING: If you happen to be a dreadful human who has never opened your heart to a dog- well then... stop snickering and GO AWAY! You wretched Homo Sapien.